The concept of paired beer dinners is relatively new to Cheyenne. Back in Upstate NY places like the Colgate Inn have been pairing beers and great food for several years. 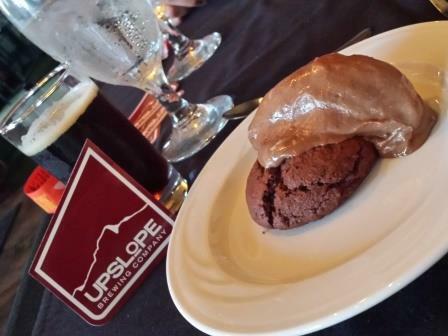 Last night Epic Brewing and Upslope came together with The Suite Bistro in Cheyenne for a collaboration paired beer dinner. The dinner was organized by Kyle Doyle and the folks at Teton distributing who are trying very hard to raise the craft beer profile here in Cheyenne. This is the 3rd or 4th paired brew dinner Kyle has helped organize in the last year, and that deserves a big thumbs up. The dinner began with a Buffalo Style Chicken and Chorizo Sushi Roll. Think chicken wings with out the finger mess. The blue cheese, buffalo sauce combined with the chicken and chorizo left a strong earthy flavor that paired well with both beers offered for the course. Upslope presented a Craft Lager and Epic rolled out its Sour Apple Saison. I enjoyed the Saison quite a bit and the crispness of the lager balanced out the flavors of the appetizer. 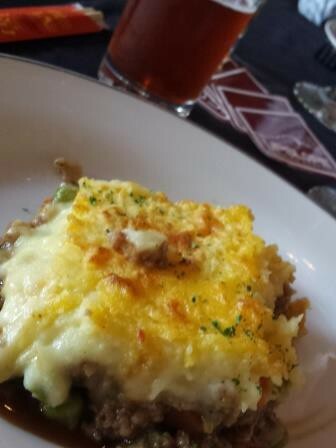 The 2nd course for the evening was a classic dish that screams more comfort food than summertime beer dish in a lamb meat shepherds pie. It worked though, as the rich meaty flavors really dominated and made it a savory dish. The two beers paired with it were the Imperial IPA from Upslope and the Brainless on Cherries from Epic. I really enjoyed the Brainless on Cherries and will purchase some of this for my future enjoyment, but the pairing of both beers with the shepherds pie was a bit off. 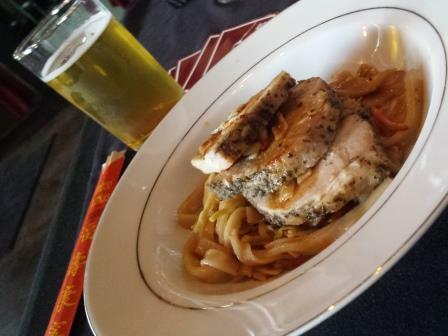 The main course for the evening was a spice rubbed pork loin atop vegetable pad thai. It was served with chop sticks and as someone who normally is not a fan of Asian inspired dishes, I found this to be outstanding. I really enjoyed the flavors the chef combined together for a fantastic main course. 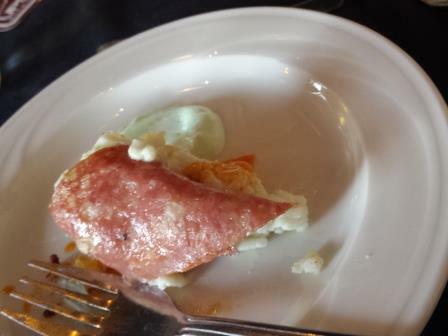 The dish was paired with Upslope’s Thai Style White IPA and the Epic Escape to Colorado IPA. The Escape to Colorado is on of my new favorite IPA’s right now so I liked that pairing better. I expected the Thai IPA to be the better pairing, but it wasn’t. I chalk it up to a very different spice profile than the actual dish. The evening was finished off with a cocoa buttermilk biscuit filled with a chocolate mousse. The biscuit was dry, but the chocolate mousse was very flavorful and creamy. It was paired with the Upslope Brown Ale, which was my favorite beer of the night and the Epic Lil Brainless on Raspberries which was also an excellent beer and choice for the dessert. I give the Suite Bistro a lot of credit for hosting this dinner. They are not known for their beer program (it is non-existent) or for their food. They shined on both accounts last night. I’ll jump up on my soapbox briefly here though. There were about 25 people in attendance for the dinner. I often hear that Cheyenne has no culinary pulse outside of Morris House Bistro. If we don’t support the efforts of places like the Suite when they do dinners like this, we have no one to blame but ourselves. They stepped out of their comfort zone, and frankly hit it out of the park. They should receive all the credit in the world for that. Thanks Teton and the Suite for elevating the craft beer game in Cheyenne, even if just for one night. Back when we lived in NY, the explosion of farm to table restaurants and great craft breweries spawned a plethora of paired beer dinners to take advantage of. Some of my favorites included the ones leading up to Hop Fest. It had become a tradition we looked forward to every year. The Fort Collins area has a lot of these dinners, but they have been sorely lacking in Cheyenne until just recently. Suite Bistro and Green Flash paired up a while back and last week the Rib and Chop had a dinner with Epic beers. 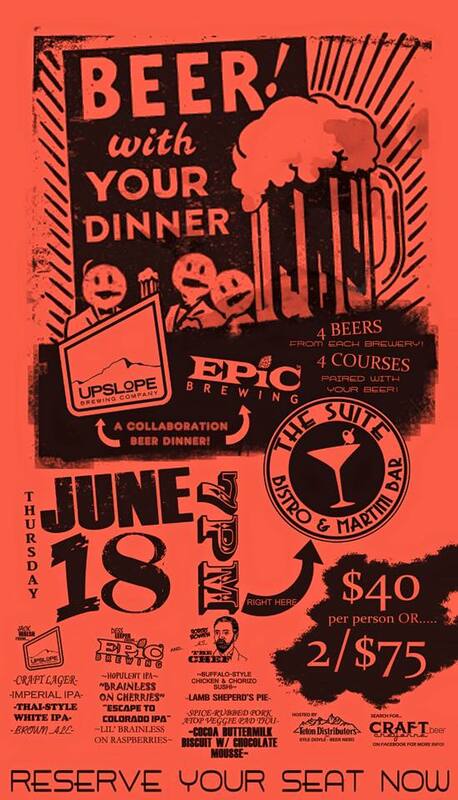 Now the Suite Bistro is ready to do it again on June 18th and it will pair Upslope Brewing and Epic Brewing along with four courses prepared by Chef Bowen. The cost is $40/person, or get 2 dinners for $75, which is an outstanding price for a four course meal including alcohol. It looks like it will be a great dinner and brewery reps Jack Walsh (Upslope) and Dess Leeper (Epic) will be on-hand to talk beer and give away cool brewery goodies. The event will be hosted by Teton Distributors’ resident beer nerd Kyle Doyle. Seats are limited, so reservations are a must. It looks like a great way to get a jump on the Wyoming Brewers Festival weekend. One thing that has been lacking since our move to Cheyenne, has been the beer and food pairing experience which is very popular back in Central NY. 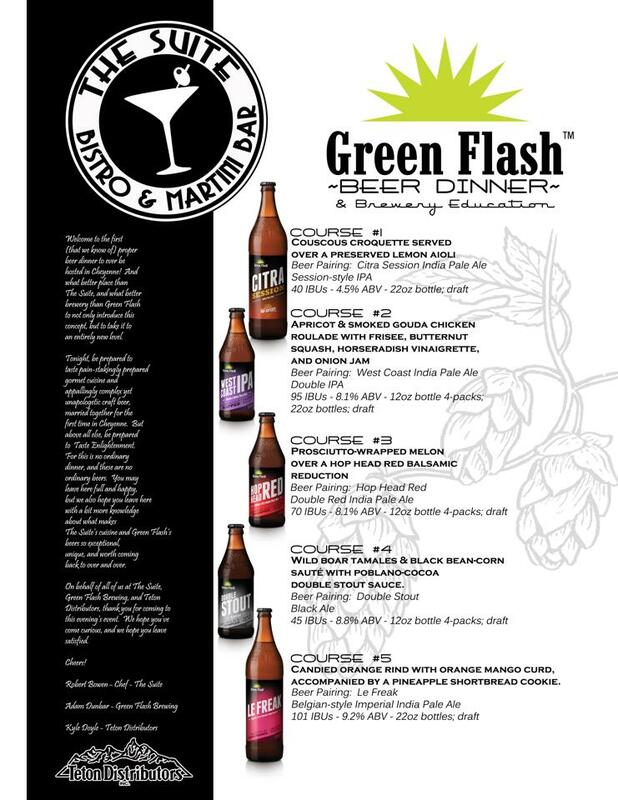 Tomorrow night at the Suite Bistro and Martini Bar in downtown Cheyenne, they are hosting a dinner with beers from Green Flash Brewing. I just learned of the dinner yesterday through a post on the Wyoming Brewer’s Festival Facebook page, and the details are fairly sketchy. There is no information about the dinner on the Suite’s website, and the poster provided on the Brewer’s Festival page has no date, time or price information. The only information we were able to gather came from the post on the Brewer’s Festival wall from Kyle Doyle. Attention all craft beer lovers in Cheyenne! This is your last week to purchase tickets for the first-ever Green Flash Beer Dinner & Brewery Education, going down this Friday night at The Suite Bistro! $40/person gets you 5 amazing courses specially prepared by executive chef Robert Bowen, and 5 killer Green Flash beers. Not to mention the chance to grab some killer Green Flash giveaways! The menu and beer parings sound outstanding, and maybe I’ll get a chance to go if I can figure out what stinking time it starts. I’d like nothing more than to encourage more and more beer and food pairings in Cheyenne. I’ve run it by several non-profits and I’m always met with a shrug. If I go I’ll let you know how it tuned out.